As advertised, our September meeting was "more than just a walk in the park"! "Just wanted to give my quick feedback on today's meeting. The presentation and following tour was awesome. A great big thank-you to Faith Technologies for allowing all the folks the time to spend with us today. Also the meal was outstanding and the bus ride was exceptional... Cant wait for next months meeting !!" We live for that kind of feedback! A much more comprehensive review of this event has been prepared by our sponsor Master's Academy. Click here for some real information. The Gordon Bubolz Nature Preserve advanced microgrid uses 200 kW solar photovoltaic energy; a 30 kW hydrogen fuel cell; a 100 kW lithium-ion battery storage system that utilizes Panasonic technology; a 65 kW micro-turbine; and a 60 kW Kohler natural gas generator to power the 18,000-square-foot nature center building. This innovative vision, features modern technology, allowing the new Environmental Center building to reduce energy costs and strengthen its ability to become sustainable. Register early; space is limited! Impress a friend and bring a guest (or your boss :-) Remember, first time attendees roll for free ! Location Update: The presentation location has been changed to Faith Technologies Headquarters. 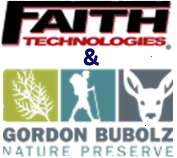 ***Faith Technologies will provide a bus service between the two locations, but there is ample parking available on site at Bubolz for those who wish to drive themselves.